Lancashire Thunder have signed World Twenty20 winner Hayley Matthews as the inaugural Women's Cricket Super League squads have been confirmed. 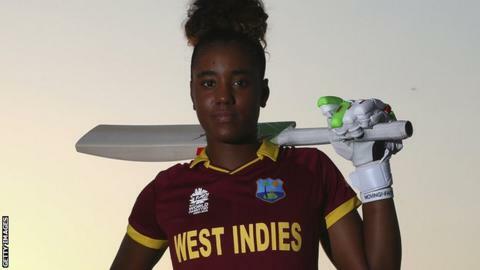 West Indies batter Matthews, 18, replaces Australian all-rounder Jess Jonassen who suffered an injury. Ex-England internationals Laura Newton (Lancashire Thunder), Beth Morgan (Surrey Stars) and Arran Brindle (Southern Vipers) have also joined. The six-team competition runs from 30 July to 14 August. Earlier this month, the overseas signings were unveiled following the allocation of the 19 centrally contracted England players. First-class venues including The Oval, Old Trafford and Headingley will host the 15 group matches with Finals Day on 21 August. Lancashire Thunder: Kate Cross (EW), Sarah Taylor (EW) (capt), Danielle Wyatt (EW), Sarah Coyte (O), Deandra Dottin (O), Hayley Matthews (O), Sophie Ecclestone (EWA), Emma Lamb (EWA), Ellie Threlkeld (EWA), Natalie Brown, Georgia Holmes, Laura Marshall, Natasha Miles, Laura Newton. Nalisha Patel. Loughborough Lightning: Georgia Elwiss (EW), Rebecca Grundy (EW), Amy Jones (EW), Beth Langston (EW), Sophie Devine (O), Ellyse Perry (O), Dane van Nierkerk (O), Evelyn Jones (EWA), Alex MacDonald (EWA), Georgie Boyce, Thea Brookes, Amy Gauvrit, Lauren Griffiths, Sonia Odedra, Paige Scholfield. Southern Vipers: Charlotte Edwards (EW) (capt), Natasha Farrant (EW), Lydia Greenway (EW), Suzie Bates (O), Sara McGlashan (O), Megan Schutt (O), Georgia Adams (EWA), Ellen Burt (EWA), Katie George (EWA), Arran Brindle, Isabelle Collis, Daisy Gardner, Alice Macleod, Fi Morris, Carla Rudd. Surrey Stars: Tammy Beaumont (EW), Laura Marsh (EW), Natalie Sciver (EW) (capt), Rene Farrell (O), Marizanne Kapp (O), Meg Lanning (O), Sophie Dunkley (EWA), Alex Hartley (EWA), Bryony Smith (EWA), Aylish Cranstone, Grace Gibbs, Cordelia Griffith, Raveena Lakhtaria, Beth Morgan, Kirstie White. Western Storm: Heather Knight (EW) (capt), Anya Shrubsole (EW), Fran Wilson (EW), Lizelle Lee (O), Rachel Priest (O), Stafanie Taylor (O), Freya Davies (EWA), Sophie Luff (EWA), Amara Carr, Jodie Dibble, Rosalie Fairbairn, Georgia Hennessy, Sophie Mackenzie, Cait O'Keefe, Izzy Westbury. Yorkshire Diamonds: Katherine Brunt (EW), Jenny Gunn (EW) Danielle Hazell (EW), Lauren Winfield (EW) (capt), Alex Blackwell (O), Beth Mooney (O), Shabnim Ismail (O), Hollie Armitage (EWA), Steph Butler (EWA), Alice Davidson Richards, Teresa Graves, Katie Levick, Anna Nicholls, Laura Spragg, Katie Thompson.